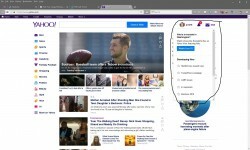 Does anyone know the purpose of these Yahoo notifications & how to disable them? I have no idea what these alerts are for & cannot find a way to disable it. Any help is appreciated! Re: Does anyone know the purpose of these Yahoo notifications & how to disable them? Thank you, but this did not work. This turns off desktop notifications which is a completely different type of notification. Apparently there's no way to get rid of this thing. Does disabling "Personalized Content" help? Just gave it a shot. Reloaded Yahoo, so far no notifications. Thanks. View Next Unread Hard Drive needs defrag every other day?